4x7 Customized Indoor Magnets 55 Mil Round Corners will give your brand message the best visibility it could get. Made In USA, they have a thickness of 55 Mil. These custom square and rectangle magnets can be placed on refrigerator doors, coffee machines, shelves and any metal surface in home and office. They can hold pictures, loose papers and reports against the metal surface. Full color processing, no set up fee and free design are some of the perks we offer you to make your promotions with these custom magnets amazing. Order these magnets now to enjoy free shipping in the Contiguous USA. 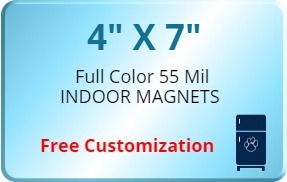 Request a quote to know price cuts that you can avail for wholesale 4x7 Customized Indoor Magnets 55 Mil Round Corners.